As part of our Commercial range offering, Dexion Asia is a distributor of Bruynzeel Storage Systems in South East Asia, with exclusive rights in Singapore, Philippines and Hong Kong. 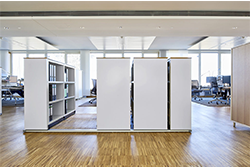 Whatever your storage challenge, let us help you find the optimal solution for your needs. 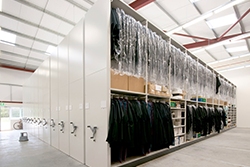 Here’s a selection of case studies that demonstrate how your capacity can be optimised with Bruynzeel’s storage systems. The look and feel of the HQ was designed to reflect the vision and identity of the brand. Open and bright rooms create space for creativity. 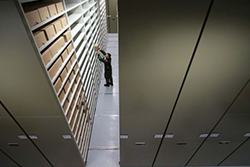 This archive facility provides secure storage of archive material for circa 70,000 archive boxes, and storage of special media material, such as videos, film reels, photographs, microfilm, etc., which require specific storage conditions. The Rijksmuseum is one of the world’s top ten museums. 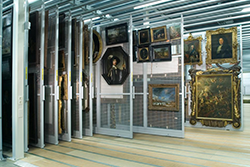 The installation has been designed to guarantee safe movement, storage and conservation conditions for the collection. This university achieved its ambition to create a modern library that meets the needs of today’s students. Central to the space planning was a requirement to increase stock capacity without compromising the overall design and the need for student study spaces. The solution needed to be highly space efficient to fit the largest number of outfits into the smallest floor area possible. 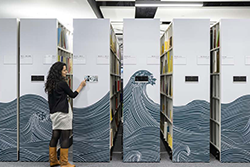 A characteristic of the 4m high mobile shelving system is its wide “floating” aisle, which enables multi-person access to the storage. 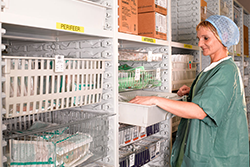 The storage system chosen doubled the hospital’s existing storage capacity. The system came with shelves and drawers and baskets for storing small objects, plus modular baskets, as standard.